…not only in her technique, but also in her unique style and vision. Shelly Broughton started her career as a freelance court stenographer, Suffering a personal tragedy, losing her mother of only 49, she was overcome with the realization that life is short. She quit her job and dug deep to envision a path surrounded by creativity and paint; that would feed her soul and the people who buy her artwork. 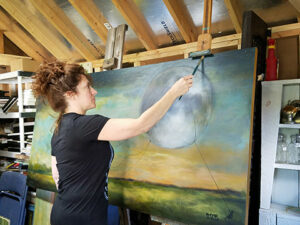 Shelly Broughton creating on a fresh canvas. Her career started painting clothing, which lead to painting large murals. After years of dragging a ladder around and painting what others wanted, she decided to study under the direction of renowned artist, Marta Jaremko. Jaremko’s work has been shown in galleries across the glob. “When making the decision to pursue painting on canvas full time, I knew I wanted to perfect my skills,” stated Shelly. “She was an amazing mentor and she really has made an impact on my career as an artist,” adds Broughton. Shelly’s painting can be described as irresistible. “Paint something irresistible and you are successful,” states Shelly. Her animals are happy, alluring and they bring joy, but they have incredible technique and life likeness. Shelly also does a line of moon themes that are so powerful. “Complete strangers walk up to the art work and start to cry. Something brings them great comfort,” says Broughton. 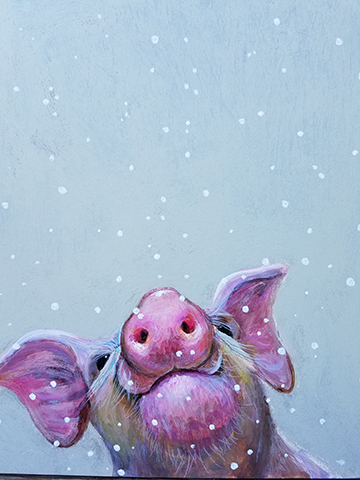 Joyful farm animals by Shelly Broughton. 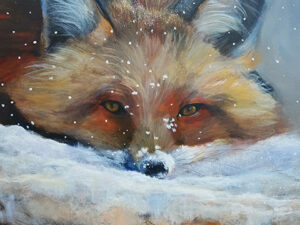 Irresistible animals by Shelly Broughton. She started her business when her twin girls were still in cribs. Now her daughter Nicolle opened her own store 4 years ago in an Urban Historic area that features Shelly’s work. “It gave me a brand-new platform. Allowed me to try new things, see how the public would react to different bodies of work and I tried a little of everything. 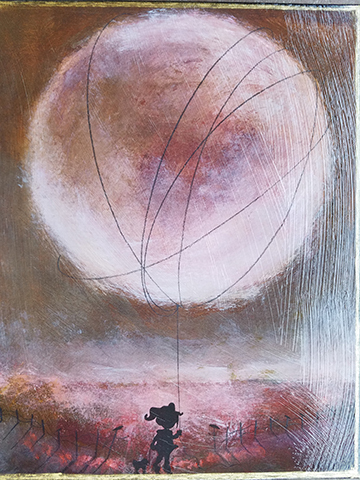 Nicolle’s taste has influenced my painting and I am a better painter because of it,” stated Shelly. Shelly offers both originals and hand-embellished prints from the originals. Each piece has layers of hand-painted layers on top of the print. Her business has grown so much that her daughter Chelsea has been an apprentice and has now perfected the technique. Every single print can vary and be unique and it looks like an original. Limited Broughton’s paintings available wholesale!